"Quick and easy, this baked ziti will help save you time and be a hit with the family." Preheat oven to 400 degrees F. Meanwhile, brown ground beef in large nonstick skillet over medium-high heat. Combine Sauce and water in large bowl. 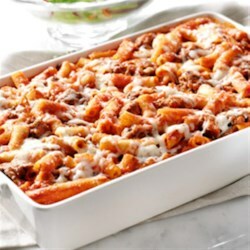 Stir in browned ground beef, ricotta and Parmesan cheeses, then uncooked ziti. Pour ziti mixture into 13 x 9-inch baking dish. Cover tightly with aluminum foil. Bake 55 minutes. Needs much more flavor. Maybe add garlic and oregano plus more tomatoes. Tastes great and it's super easy to make. I often add extra ricotta and use a larger container of sauce. Quick and easy. Made it without the meat for the kids. They all enjoyed it greatly, even my husband liked it. Next time I will make it with hamburger or sausage. So quick and easy. Used Rotini and it was great!